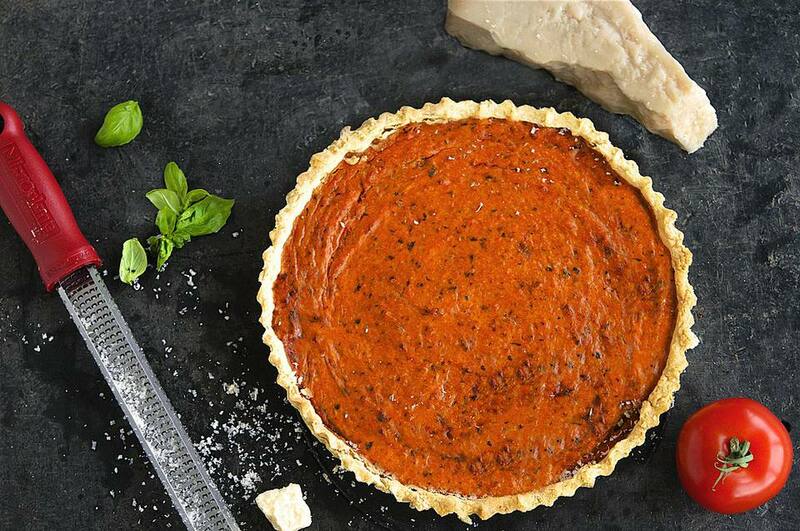 This Summer Tomato Tart is the perfect tomato tart recipe when you have lots of fresh, fragrant tomatoes in the garden. The tomato tart recipe is one of my most requested dishes from family and friends. The tomato tart is made using my Best Ever Tomato Sauce Recipe cooked together with eggs and Parmesan cheese. It makes a delicious and versatile tart. Served warm with a salad it is a perfect supper dish or a light lunch. Cold it goes really well in a lunch box, or a party or picnic food. I like to decorate the tart with salty, canned anchovies and a few black olives, but that's optional. Make the sauce with fresh tomatoes when in season, otherwise, tinned chopped tomatoes work really well. Place the flour and salt into the bowl of a food processor. Add the butter and 2 tablespoons of cold water. Pulse mix until all the ingredients are incorporated into a dough, add more water a tsp at a time if the mixture doesn’t stick together and pulse again. Wrap in plastic wrap and rest in the refrigerator for 2 hours. Butter a 10”/25cm loose-bottomed tart tin. Unwrap the pastry, roll and line the tart dish making sure it is even on the bottom and sides and there are no holes. Prick the base of the dish using a fork. Refrigerate for 30 minutes. In a large baking bowl, add the eggs, butter and Parmesan to the tomato sauce and mix very well with a wooden spoon, season with a small pinch of salt and a few twists of black pepper. Place the filling into the pastry case. Decorate with the anchovies and olives if using – the tart is equally delicious without them. Bake for 20 minutes in the preheated oven. Allow to cool for 15 minutes before serving. Serve with fresh basil leaves and a side salad. Tip: In a rush, you can always make a quick tomato sauce. It does not have the depth of flavour of the sauce used in this recipe but does also work really well.